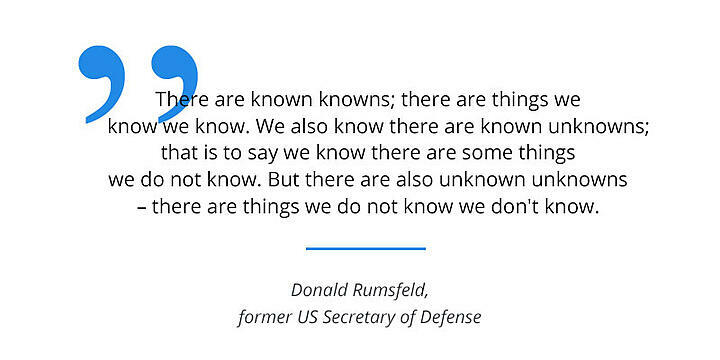 The above quote is from the former U.S. Secretary of Defense Donald Henry Rumsfeld, who mentioned “unknown unknowns” (Rumsfeld, 2002). Since then, people have started using quadrants of knowledge, i.e., known known, known unknown, unknown known, and unknown unknown, to understand and explain the nature of risk but also of leading to an opportunity. For innovators so much of innovation is hard to detect, it needs discovery and working through these quadrants of knowledge as well. We need to treat ideas the same on how anything needs assessing, there are ‘known knowns’ and ‘unknown unknowns’ and we need to prepare for both in our innovation activities. Our pursuit in life is often the same as our innovation efforts, the search for discovery. Often it happens, that we already feel better equipped for exploring and observing by just getting out of our usual everyday working environment.Through this positive action, we can discover something that had previously been unknown, a new opportunity to give it new value. For me, a good idea management system needs to be set up for all known and unknown possibilities to capture their potential. The front end of innovation has the challenge of generating ideas, but these come from these two distinct avenues - improving the known and discovering the unknown. Let me explain why breaking down our thinking into knowns and unknowns helps us. The knowns are those products, services, processes, etc. that we know we can improve upon. The ‘knowns’ are usually tangible in what we already see. We are often specifically asked to improve on them by finding cost savings, improving their functionality or design. It becomes our task in delivering alternatives, in new varieties, updates, technology enhancement, or simply recognizing the lifecycle of the existing needs refreshing, changing or altering. Much of this work is incremental or distinctive in innovation. This is where a good, well designed idea management system is ideal, being able to deal with capturing and translating the idea and turning it into something realizable and offering improved value on the existing (knowns). This is managing the innovation portfolio in a systematic and focused way. Idea management software can offer a structured approach that provides a full concept lifecycle management process, directly built into it. It takes the management of ideas to implementation planning as its hand-over point is when the concept moves into commercialization entering usually a portfolio and pipeline management system. The constant challenge is coming up with ideas that are not simply one-offs, they need to be continuous in their pursuit. Most of our innovation in organizations is based on incremental improvements that need a sustaining capability. One of the most important parts of any sustaining capability is having access to software that allows for multiple activities to build. This capturing needs a more sustaining routine, a certain familiarity, including an idea management software that can be customized constantly to your ongoing needs, being ideal for managing most of our business needs, that of protecting and building the core. When you are dealing with assessments of the known, there is a need to have a good evaluation process. Ideas need to be opened-up to a greater stimulus, to an audience as wide as possible to contribute and gain their best insights or suggestions. It is encouraging and capturing that additional knowledge, that additional piece of the jigsaw that was missing, that someone else can provide in the development process. Your job is to improve on the nascent idea you have, to get others involved and build upon this further. The last thing you need to do is spend large parts of your time on the mechanics because you are directing your creative energy away from improving your ideas into winning ones. 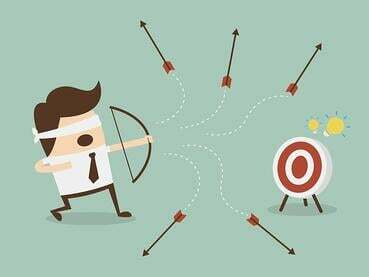 Solutions need to focus on value, need and growth outcomes and often the reason why we settle on the knowns far more is that we are seeing ways which are seemingly easier to advance, to make improvements on the existing. Thankfully having a good idea management system can greatly support this. The real value of any software capturing system is more for the unknowns as it requires greater collaboration, observation and awareness. Unknowns need open, questioning minds and this requires a place to capture them and encourage others to collaborate and equally work on moving them from the unknown to the known and eventually highly valued. The unknown becomes very different in approaching idea generation. It needs a different type of approach. 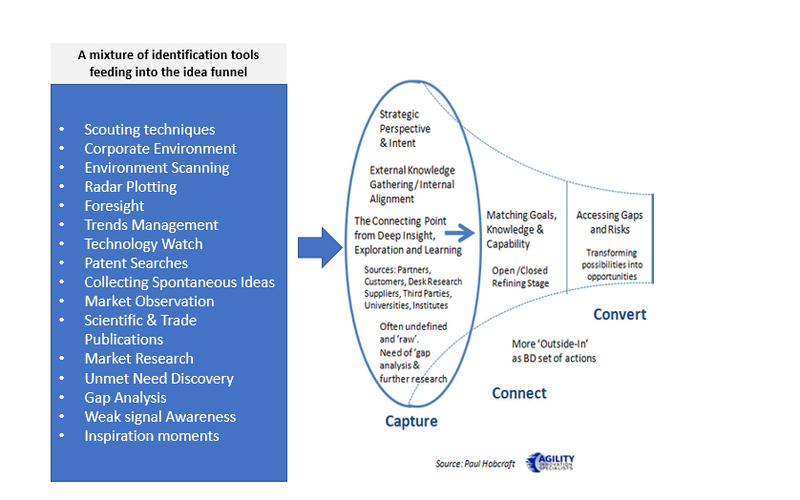 It needs to have a different level of innovation idea funnel. 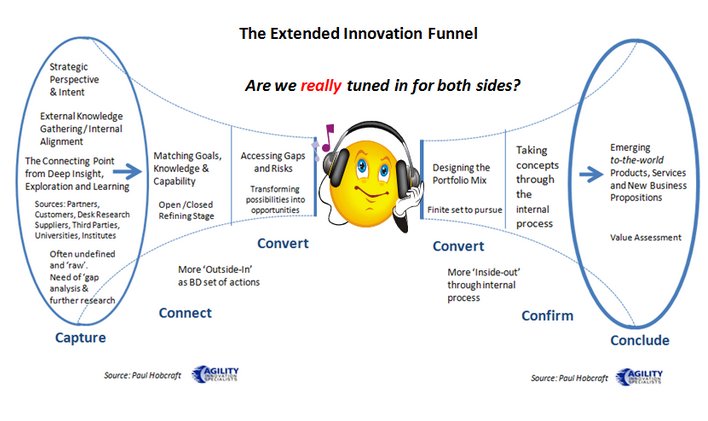 I wrote about this some time back, discussing the extended innovation funnel (here) and used this visual. 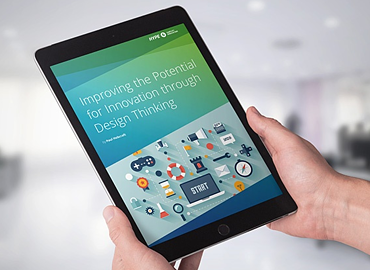 It begins to break down the complexity we find in managing the two ends of the innovation process, discovering and driving concepts through the system. The unknowns require a wide usage of capturing tools and techniques. Observation is most probably one of the most important skills to have. It is highly valued in the idea management process. Thankfully technology made available many of these observing techniques and became ‘bolt-on’ modules or are offered in the idea management software solution out of the box - meaning you can automate this “fuzzy” front end. I always believe the more your organization is exposed to common tools, the more they form a common basis for building a communicating language, protocol and common purpose. A common tool I consider as highly valuable within the idea to commercialization process as it frames dialogues in time, resource allocation and the complexity of approach is the three-horizon-framework. If we have a good frame to frame uncertainty within innovation then you can begin to describe this to others while managing the unkowns. 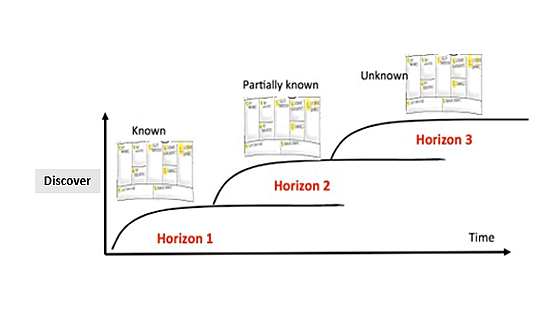 The three-horizon framework has terrific value for considering options, discussing uncertainty and framing the business of today with the challenges you might be facing of the future. 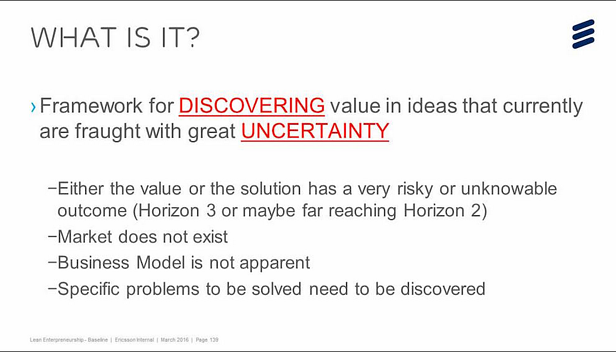 For example, you can take the knowns and unknowns and recognize these have different discover needs and time horizons. They need different resources and thinking through to manage. This early recognition can change the very tone of innovation conversations and recognize what it takes in managing ideas that are partly incremental to service today’s business needs and more transforming, to help support the needs of the future. In both cases, incremental and transforming, are taking ideas through to commercialization but in radically different ways. The value potential of those unknowns, pointing to the future, can grow in understanding over time, in exploring and experimentation. All ideas that are ‘projecting’ change on your existing products, services or business models implicate the same - you must ensure you have the right conversations about time, resource allocation, expectancies and the ‘stark’ difference between exploitation and exploration when dealing with managing different types of innovation. The pressure lays always on: how to quickly turn an unknown into a known? The ability to prototype, changing an intangible concept into a working model, transforms the idea management stage. I would argue that prototyping needs to be in the idea management thinking from as early as it can be. It accelerates understanding, it validates and builds the experience, it allows valuable new insights to ‘play out over time’ to give increasing value. The more we prototype, the more we provide ‘hard’ evidence of the value of an idea turning into a concept to eventually arrive at a commercialized proposition. By turning to a structured system of managing emerging ideas can allow you to capture your nascent idea, explore and collaborate around them. Framing them even further in the context of value, needs to be highly adaptable, robust and able to be scaled out. Idea management software provides this. 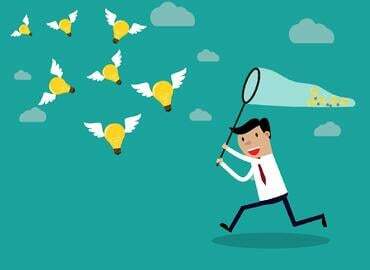 Innovation always has the best chance to flourish when people become engaged and really want to actively engage in searching out new ideas that have value and worth, but they need a place where this can be captured and shared. To achieve that ‘engage and exchange’ culture, you need a well-structured management system that can respond. Good idea management software systems give you a far better chance to innovate well, managing both the knowns and unknowns by capturing your discovery and exploration journey in effective and efficient ways, that gives you a clear system of record and the source of your organizations collective knowledge to explore and exploit constantly.